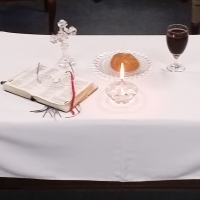 A Relaxed, welcoming time of worhsip, study, prayer, digging deep into God's Word for our lives, and Communion. This service time is for those wishing to deepen their Biblical knowlege, those for whom Sunday Morning worship is difficult, or simply those who love to share in a community of believers. All are welcome!